Former Sussex captain Chris Adams says the club must regroup quickly from their T20 Blast exit to avoid relegation in the County Championship. 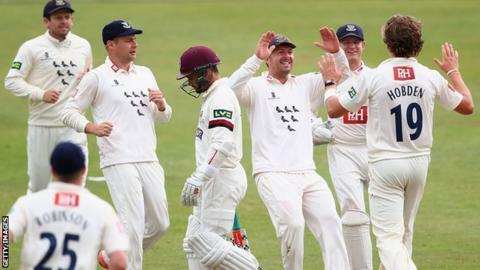 Sussex, who lost to Northants on Wednesday, are currently eighth in Division One with four games remaining. "They have got to deal with this disappointment and do it quickly," Adams, 45, told BBC Sussex. "They need to clear it out of their system and plan for what has to be done to keep Division One status." David Willey hit a 40-ball century as Northants defeated Sussex by seven wickets in their T20 quarter-final. Sussex have gone seven Championship games without a win and Adams wants the side to rediscover their early season form, when they beat Hampshire and Worcestershire. "You only need to think back to the way it started - they came out the traps absolutely flying, won two in a row and everything at that point was going fantastic," he said. "It looks hard work at the moment and there is a bit of negativity coming into the squad and the environment. That is not the fault of anyone - it is just what happens. "They can turn it around and say they will be a different side in the next four or five weeks, by being aggressive and attacking sides." Adams, who captained Sussex to the Championship title in 2003, 2006 and 2007, believes two wins from their last four matches should be enough for the county to clinch survival. "They need to construct how they will go about it - they will have to do it in a positive way and take a few risks," he added. "I'd like to see the younger players given more of a go as well, as with youth you get that real desire to make a difference. "There is a big task ahead for Mark Robinson, Ed Joyce and the team, but the talent is there. It is just a case of making sure the focus and mentality is right."